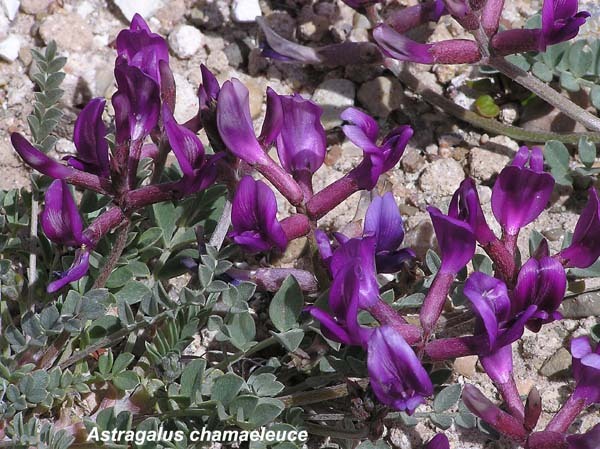 This Astragalus shouts out at you with large, deep magenta flowers. You'll hear it on hot, dry hillsides early in the spring. Astragalus chamaeleuce grows in sprawling low mats of light green leaves topped by numerous clusters of flowers. The upright banner petal of the flower curves backward slightly and the two forward thrusting wings are long, straight, and narrow, gently enfolding the vertical keel. Seed pods are swollen and often almost spherical but tapered to a sharp prow-like point on one end. "Chamae" is Greek for "on the ground" and "leuc" is Greek for "white"; perhaps these refer to the light color of the leaves and the sprawling growth pattern.